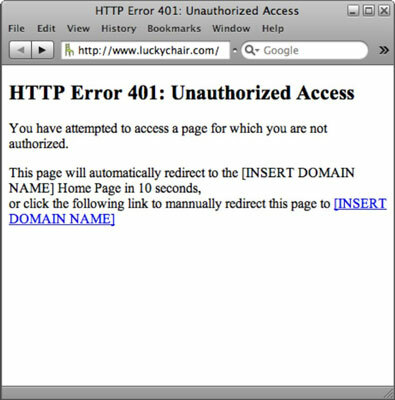 401 Unauthorized Access: This message gets displayed when people attempt without permission to access web pages that are password protected. 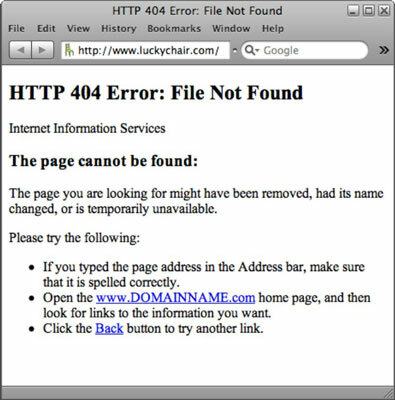 404 File Not Found: This message appears when visitors click a broken hyperlink or type an incorrect web address in the browser’s address bar. You can customize these messages to match the design of your website, and with a little help from your host provider, you can have these custom error pages installed and in service on your domain within 24 hours or less after transferring the site files to the remote server. The 401 Unauthorized Access page usually includes a short message to visitors along with the refresh meta tag that redirects visitors to the home page or some other location on the web after a specified number of seconds. * Open the www.DOMAINNAME.com home page, and then look for links to the information you want. To customize your own 401 and 404 error pages, create two new web pages based on existing pages on the completed site. This ensures that the new pages use the same layout and graphics as the rest of the site. Save these files with the filenames error401.html and error404.html, and then edit the content areas for both pages by using the preceding examples. If desired, add more information to suit your site’s particular needs. For example, rather than just displaying the URL of the home page on the 404 error page, why not also include links to all the pages on your site, similar to your site map page? The same technique would also work for the 404 error page. The customized content is entirely up to you, so be as creative and helpful as you can to the visitors (potential customers) that will be viewing these pages.